Panel garage doors combines the look of wood grain textured panels with the durability of high quality corrosion resistant coloured steel. From the closed position a single panel door will slide up and overhead on rails to the fully open position. 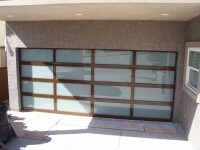 A disadvantage of monolithic panel doors is that the swing up arc of the door occurs partially outside the garage. This means a vehicle must stop and park several feet in front of the door to avoid being hit by the garage door when it is opened. Each panel of a sectional door has its own connection to the door track. This increases reliability and robustness compared to a monolithic doors which has only a couple of track connections for the whole panel. 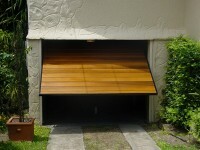 Tilt Garage Doors comprise of a one piece tilting panel, fitted with pivoting arms at both sides of the opening, which moves out and up from a vertical position into a horizontal position. These allow almost any material to be used to make a garage door and offer one of the lowest possible headroom requirements.